Norway’s newly expanded majority government came under fire right away in Parliament this week. 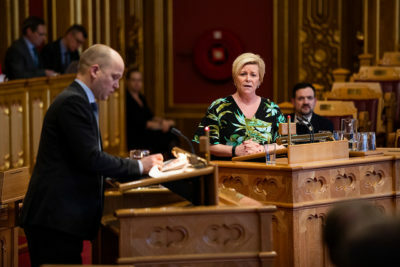 Finance Minister Siv Jensen had to fend off a barrage of questions and criticism regarding the “chaos” that’s emerged over how job benefits now must be accounted for, and taxed. It’s not a position Jensen would have expected to find herself in. Both Jensen, her Progress Party and the conservative government in general pride themselves on lowering the tax burden on Norwegians. Some new rules that took effect from January 1 are having the opposite effect, however, and suddenly hitting everyone from waiters in restaurants to bus drivers and members of frequent flyer programs very hard. Employers are upset, too, along with their employees. The new rules were meant to clarify the value of various job benefits, from tips for restaurant servers to discounts given to retail store employees, or free travel passes for bus drivers and their families. Instead it all seems to be backfiring and placing Jensen in the unusual position of having to defend tax rule changes she hadn’t expected would be a problem. Since the beginning of this year, employers were made responsible for declaring to state tax authorities all kinds of benefits granted to employees. Employers, for example, are now supposed to account for frequent flyer bonus points or miles accrued by employees when they’re traveling on business, and declare them as a taxable benefit if used for private travel. Hotel and restaurant employers are supposed to declare tip income on behalf of employees, and subject it to taxes, while even the value of free tickets granted to volunteers at music festival are supposed to be subject to taxation. It’s all led to loud protests from opposition parties in Parliament, large business associations, national employers’ organization NHO and labour organizations. They all find the new disclosure rules frustrating, unnecessarily bureaucratic, difficult if not impossible to administer and simply unrealistic. In the case of frequent flyer benefits, for example, airlines refuse to divulge information from individual passengers’ accounts, while companies claim they have no way of knowing whether an employee has used frequent flyer points accrued via work travel for private travel. Even the frequent flyers themselves can have trouble discerning which points were earned through work as opposed to their own personal travel, credit card use, hotel or rental car bonus programs. Yet Jensen’s finance ministry and its internal revenue service remain firm that the new rules must be followed. Jensen has tried to justify the new rules as a means of making sure employees realize the full value of job benefits as an important part of their total income, so that they’ll later in life receive larger pension payments. Some major employers including Norway’s biggest bank, DNB, and state oil company Equinor have responded by simply issuing a ban against employees using freqent flyer bonuses accrued through business trips for personal use. They hope that will relieve them of the responsibility of tracking all employee travel, frequent flyer memberships and bonus accrual. That remains to be seen, while also leaving it up to employees to abide by the rule, which can in turn be difficult to enforce. Things came to a head when a bus driver in the mountainous county of Sogn og Fjordane found out that the value of his free bus passes for himself and his family would leave him with an extra tax bill of around NOK 30,000 (USD 3,600), regardless of how much or how little they rode local bus routes for free. Henrik Asheim, leader of the Parliament’s finance committee for the government’s own Conservative Party, agrees with Raja that all the bureaucracy and frustration in trying to comply with the new rules will also likely result in little new tax revenue. Employers, moreover, are also supposed to pay additional employee tax based on the value of benefits. Raja believes it’s unrealistic for employers to suddenly be held responsible for their employees’ use of frequent flyer benefits. “That’s why we all have the selvangivelse,” Raja said, referring to the official name for Norway’s individual tax return forms. The term means “to give of oneself,” he noted, maintaining that it’s up to the individual taxpayer to be responsible for and declare taxable benefits. Øysteind Dørum, chief economist at employers’ organization NHO, also has warned the government against taxing the value of discounts retail employees may receive for buying and wearing their stores’ merchandise. “I think that can damage both the work culture and the stores’ marketing efforts,” Dørum told DN. Even Norwegian politicians themselves can be caught in a bind while trying to comply with the new rules. The Parliament, for example, has no system for tracking MPs’ work-related travel, and whether they’ve earned bonus points. Others argue that bonus points can be seen as extra compensation for time away from family and friends. She also noted that employees themselves “pay the price” of benefits if they’re not declared and taxed. She stressed that the rules that took effect January 1 “have been out to hearing and were approved by a majority in Parliament.” She said her ministry had tried to assess what effects they would have.